For the serious angler there is the nearby River Finn with its plentiful stocks, particularly of salmon from March to May. The renowned Salmon Leap at Cloghan hold a particular attraction for visitors. On the River Reelin, trout of the sea, coarse and brown varieties are also plentiful. Ballybofey is only a short drive away from Lough Eske. 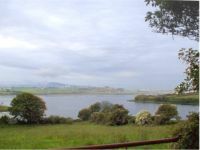 The name means 'Lake abounding in fish' and the three mile long lough is set at the foot of the Blue Stack Mountains. It fishes Salmon, brown and white/Sea Trout. In November there is a tradition of fishing for char, only one of four lakes in Ireland that have them. McComhaill Park, Ballybofey is the where Donegal GAA plays its home games. Donegal's only professional soccer club, Finn Harp of the League of Ireland, plays at finn Park. Ballybofey and Stranorlar Golf Club has an 18 hole course which is one of the most picturesque in the North West of Ireland. As the golfers go round this testing parkland course they can admire the views of the Finn Valley and the Donegal mountains.